The suede is very soft to the touch material. And many prefer to wear such shoes, soft and tender. But it is especially noticeable spots, because it is too strongly influenced by weather conditions and therefore requires careful maintenance. If your suede shoes have stains, use regular gasoline. Take a small piece of clean cloth and soak it in gasoline. Wipe the spot until it disappears. Mix a soapy solution with a small amount of ammonia. Soak in the brush Shoe and brush suede in the contaminated areas. After that, wipe the shoes clean with a dry cloth. Remember that shoes made from this material does not tolerate moisture. When wet suede to get rough. If on suede appeared, whitish spots and stains from salt, which is often sprinkled on the streets in the cities or is it just spots from dampness, take a crust of black bread and wipe the problem areas. Small spots on suede shoes can be easily removed by rubbing them with an eraser or crumb of white bread. In a glass of warm milk dissolve a teaspoon of 10% ammonia. Or replace it with a teaspoon of ordinary baking soda. Soak in the fluid with a clean cloth and RUB stains on suede until then, until they disappear. Then wipe the shoes with a clean cloth dipped in warm water, and dry. Sprinkle the spots with potato starch. Wait 40-50 minutes and brush your shoes with a brush. Mix two teaspoons of ammonia 10% and potato starch. The resulting mass is put on the designated spots and let dry. Then carefully remove with a brush. This tool helps you get rid of old stains on suede shoes. Become shiny places, wipe with a mixture of a quarter Cup of ammonia and half a Cup of warm water. After that, wash the treatment site with clean water and clean again vinegar solution. For its preparation dissolve in a liter of water a teaspoon of vinegar. 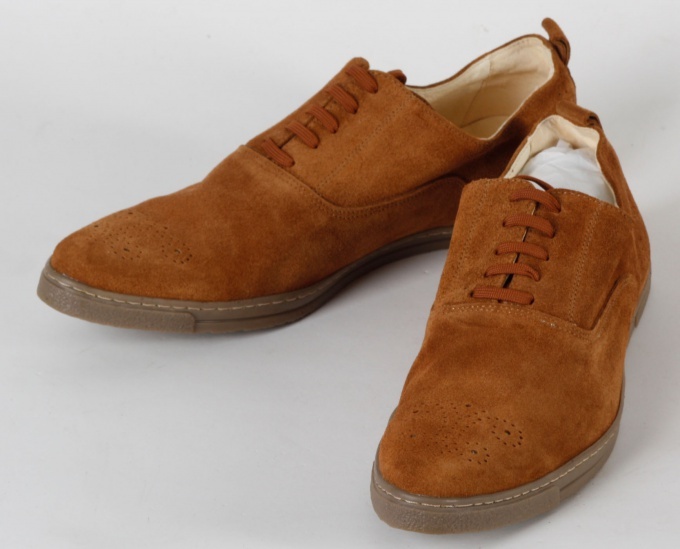 You can clean suede shoes, if long, hold it over steam and then brush with a stiff brush. Use ready-made tools available on the market. Get a special cleaner that is designed for cleaning low-pile material.